1.Clean and cut the mutton into medium pieces. Wash and drain well. 2.Heat oil in a thick bottom pan and add the sliced onions and fry till it becomes translucent. 3.Add the crushed ginger-garlic and slit green chillies.Saute for couple of minutes. 4.Add the tomatoes and let it cook until softened. 5.Add the garam masala powder and pepper powder and saute till the oil starts to separate. 6.Add mutton pieces and mix well. Add salt, cover the pan with a lid and cook the mutton medium to well. 7.Add the curd,lime juice, half of the mint leaves and coriander leaves. 8.Remove the lid and let the mutton masala cook in to a thick gravy. 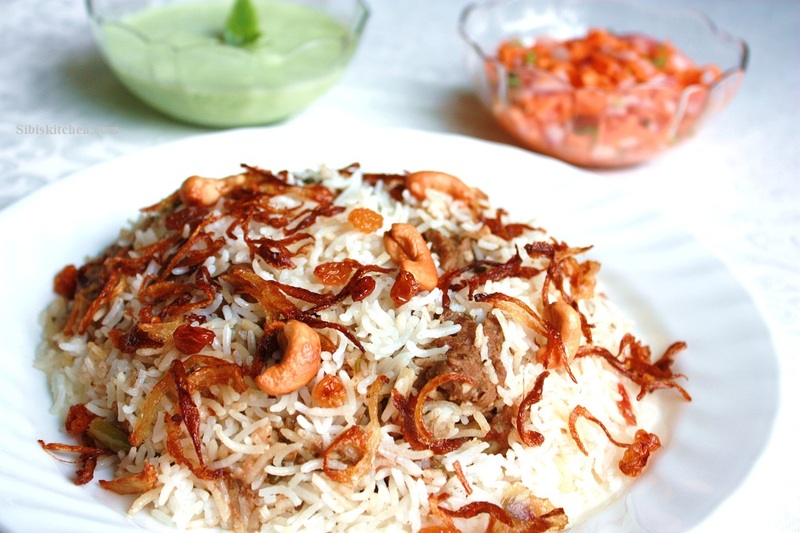 1.Clean the basmati rice and soak it in water for about 30 mins. Drain the rice in a colander/sieve and keep it aside. 2. Take an electric rice cooker, put the soaked rice, the whole spices, ghee, salt and boiling water. Follow the manual instructions for cooking the rice. 3.In most cookers, it should be done by 20 to 25 minutes. 1.Heat oil in a non stick pan and fry the white onion slices in ghee or oil to golden brown. 2.Reduce the heat and add the cashew nuts to the pan. Stir fry the cashew nuts until golden brown. 3.Remove the cashew nuts and add the raisins to the pan. Stir until they plump up. 4.Remove and keep it aside with the fried onions and cashew nuts. 2.Grease an oven proof dish with oil. Spread the rice and place half of mutton masala over it. Sprinkle some fried onions, chopped mint and coriander leaves. 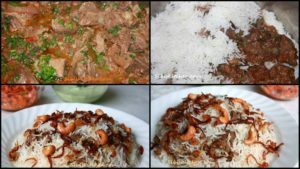 3.Spread some more rice and top it with the remaining mutton masala followed by fried onions, cashew nuts and raisins. Spread remaining rice over it. 4.Cover the dish with aluminium foil and then put the lid over it so that no vapour escapes out. 5.Bake for about 25 to 30 minutes. 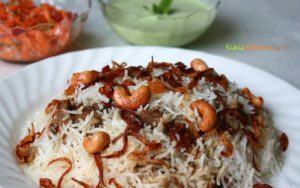 6.Serve with coconut-mint chamanthi and kochumber. 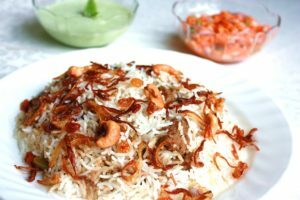 Note: In Thalassery, there is a restaurant by name “PARIS” where this biriyani is typically prepared with rose rice from Darjeeling.